Conjunctivitis or pink eye is a condition where inflammation of the outer membrane (conjunctiva) of the white of the eye (sclera) causes the eye to become red or pink. This may be caused by a viral infection, but it can also result from bacterial or fungal infection, as well as allergic reactions or injury. Keep reading to learn more about viral conjunctivitis speficially here. Inflammation of the conjunctiva that is caused by a virus results in this kind of conjunctivitis, which is a highly contagious eye infection. The virus is usually spread by airborne microorganisms that are expelled by coughing or sneezing from a person who most likely has an upper respiratory tract infection. Viral conjunctivitis often accompanies other viral conditions like flu, colds, or measles. It often affects one eye but it can rapidly spread to the other eye. A watery eye discharge is a common symptom. The pink eye may be itchy or painful. Symptoms are often worse on the third to the fifth days, after which the condition improves spontaneously. This type of conjunctivitis is often self-limiting and supportive therapy is only needed to relieve symptoms. There is no drug that is effective against common viruses and the goal of treatment is to reduce inflammation. To reduce eye redness, eye drops containing vasoconstrictors may be applied. Decongestants may be used to reduce swelling while antihistamines may be used to reduce itching of the eye. Depending on the course of the infection, these treatments may be continued for a couple of weeks. Unlike bacterial conjunctivitis, antibiotics are not prescribed for viral conjunctivitis. Consult a doctor if symptoms persist or worsen to get proper diagnosis and treatment. Inflammation caused by increased sensitivity to substances in the air, such as pollen or dust mites, can result in allergic conjunctivitis. Its most common symptom is eye itchiness, which is relieved with histamine-containing eye drops. These medications are available either by prescription or over the counter. This is another common cause of pink eye, which is due to bacteria that contaminate the eye through direct contact with another infected individual or surfaces. Infection of the ears and sinuses may also spread bacteria to the eyes, causing bacterial conjunctivitis. Common bacteria associated with this eye condition include Haemophilus influenzae, Staphylococcus aureus, Pseudomonas aeruginosa and Streptococcus pneumonia. The eye usually produces thick discharge. To treat the infection, antibiotics are often prescribed in the form of eye ointments or eye drops. These bacterial infections are sexually transmitted and may affect newborn babies during birth. Chlamydial infection can cause scarring on the surface of the eye and is a leading cause of blindness, which is highly preventable. Newborn babies can develop blindness if left untreated after acquiring a sexually transmitted chlamydial infection. Untreated mothers pass on the infection to their infants at birth and there is a 10 to 20 percent possibility that the newborn baby will develop an eye infection. Herpes simplex virus (HSV) type 2 is another sexually transmitted infection that can be passed on to infants at birth. HSV type 1 usually causes cold sores in the mouth as well as eye herpes. Pregnant women who suspect they are suffering from an STD (sexually transmitted disease) must consult a doctor for treatment before they give birth. It is common practice in the US to apply antibiotic ointment in the newborn’s eyes to prevent eye infection. This type of eye inflammation usually affects both eyes and is common among users of soft contact lens. This condition causes intolerance to contact lens, itching, tearing, heavy eye discharge, and red bumps in the inner eyelids. Taking off the contact lenses or shifting to different type of contact lenses usually relieves the symptoms. Other factors can cause pink eye, including smoke, perfume, diesel exhaust, and other chemicals. 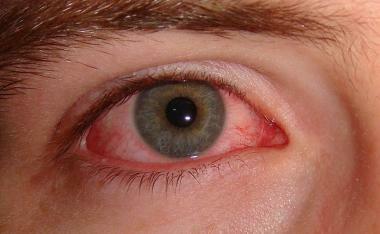 Some people also develop conjunctivitis from sensitivity to ingested substances, like herbs and spices. This condition results from the use of eye drops or eye ointments that may contain preservatives, which can trigger an inflammatory reaction.